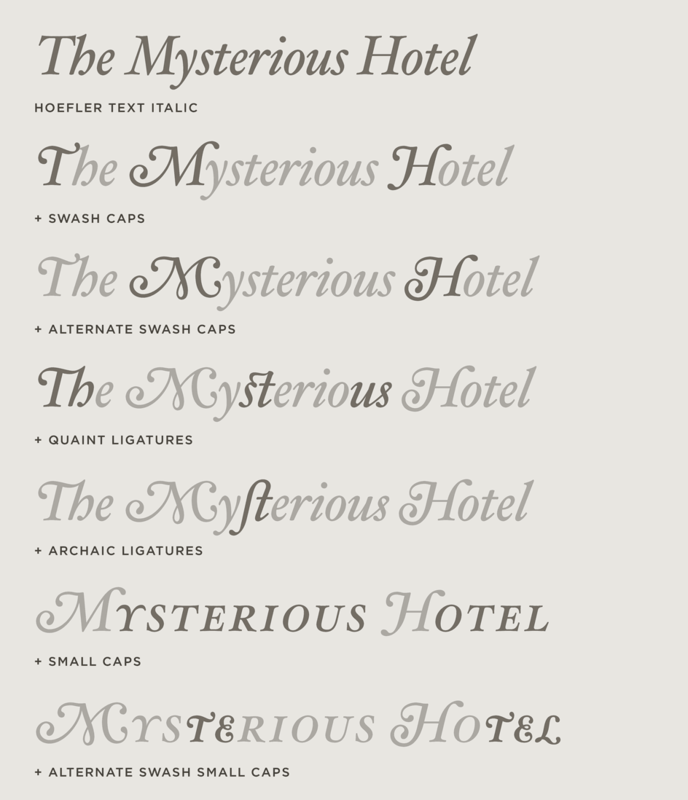 Hoefler Text Font Features: Grand Italics | Hoefler & Co. Between its swashes, italic small caps, quaint ligatures, and decorative alternates, Hoefler Text offers an unusual number of ways to fine-tune the flavor of its italics. Each of Hoefler Text’s three italic weights (regular, bold, and black) offers a number of ways to decorate the text. Swash capitals refine and elevate initial letters; each is fully kerned with the lowercase, small caps, and punctuation. Highly decorative variants of the capitals M and H are included, along with quaint ligatures (such as st and us) and archaic long-s ligatures for period settings. Each weight also includes a set of italic small caps, which themselves include swashed alternates for the letters E, L, and T.
Save $100.00 when buying Hoefler Text and Hoefler Titling together! Expression. Hoefler Text’s character set is designed with all the trimmings, from swashes and italic small caps to two fonts of engraved capitals. Grand Italics. In every weight, Hoefler Text offers a number of ways to change the flavor of its italics, from merely special to full-blown decadent. Arabesques & Patterns. Borrowing the ideas of a clever sixteenth century typefounder, Hoefler Text includes characters for creating an infinite number of decorative patterns. Engraved. A companion set of engraved capitals was once a sign of quality in a text face. Hoefler Text contains two. Special Characters. Fractions and monetary marks for technical settings, an expanded ligature set for foreign words, and a long-s for historical printing; it’s all inside. Language Support. Hoefler Text features our Latin-X™ character set, covering more than 140 languages throughout the world — including all of Central Europe.